May Tien explores the historical and cultural impact of Chinese emigrants and the food they brought to Southeast Asia. The information in this article is condensed and part of a larger body of work that is to be featured in an expansive American project on Chinese cuisine. Chinese emigration to Southeast Asia is recorded as far back as the Ming Dynasty when envoys were sent to live and trade in regions situated along the South China Sea. However, it was during the last vestiges of the Qing Dynasty, during the late 19th and early 20th centuries, that migration accelerated. This was mostly to escape domestic political instability and to search for better circumstances, with many lured by business and labour opportunities. Our focus will be on three countries where Chinese immigrants have assumed a significant culinary influence in the local population. Their food has had profound effects on the indigenous cultures, giving rise to Peranakan (Baba-Nonya) cuisine and other creative adaptations. Singapore is a country known for its multicultural society. More than 70 percent of its people are ethnically Chinese with Malay, Indian and other ethnicities rounding out the figures. As such, the cuisine of Singapore is representative of its people in a unique creolization of flavours and cooking techniques. The history of Chinese cuisine in Singapore is reflected in southern coastal Chinese traditions, with dishes such as bak kut teh (meat bone tea) and chok (congee) having gained popularity in restaurants and hawker stalls. With foreign spices and ingredients readily available in the marketplace, Chinese chefs and home cooks were able to not only replicate, but also adapt their cuisine to the local palate. Social scholars Chua Beng Huat and Ananda Rajah’s discussion on chilies as a gastronomic index for which Chinese food has been absorbed and hybridized by the local population found in the book Changing Chinese Foodways in Asia is one such example. The range of chili preparations and their consumption embodies a store of local knowledge which a Singaporean acquires through time and gustatory practice. This complex taste for chili is said to be a marker which distinguishes Singaporean (and Malaysian) Chinese from others in the Chinese diaspora. 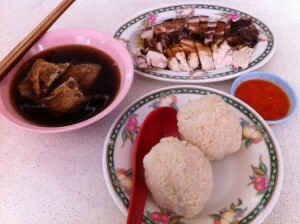 Hainanese chicken rice, for example, has been appropriated and popularized and is by all accounts uniquely Singaporean. Its popularity with locals and tourists is so great that it has been named one of the national dishes of Singapore. Hawker stalls selling this dish can be found in food centres throughout the small country. The dish originated from a southern Chinese dish, Wenchang chicken, named after the city in which it was first made. The cooking technique for the chicken is similar in both instances, where a whole bird is submerged in almost boiling liquid (either a master stock made of pork and chicken bones or only chicken) and carefully simmered to produce succulent meat. Where the two dishes differ are in the details. Hainanese chicken rice is presented as a complete meal with steamed aromatic rice, a bowl of the chicken stock and sliced cucumbers. The rice itself is a feature to the dish. It incorporates the stock from the cooked chicken where it derives flavours from the aromatics (mostly ginger and garlic) and fats. The accompanying garnishes are usually comprised of sliced raw cucumbers and a small ramekin of carefully ground garlic and red chilis. The ground chili sauce is almost as important to the enjoyment of the dish as the chicken itself. At almost every vendor, one will discover a unique chili sauce recipe that accompanies their chicken and rice. In addition, the most widely used tableside condiment for this dish is kecap manis, a thick and sweet soy sauce used predominently in Southeast Asian cuisine. Traditionally, Wenchang chicken is presented as one component of a larger and more complete Chinese meal where there may be vegetables, soup, cold appetizers, steamed rice or noodles. The dipping sauce is milder to a certain extent – raw minced ginger mixed with salt and suspended in a mild oil – the spiciness attributed to the astringent heat from the raw ginger. The flavours here present more delicately on the palate (as is typical of most southern and southeast Chinese regional cuisine). This is in contrast with its Singaporean cousin where the infusion of the chicken flavour is more pronounced and expounded upon by the headier aromatics, fiery chilis and sticky-sweet kecap manis. Similar to its neighbours Singapore and Indonesia, Malaysia has a long tradition of Chinese emigration from the Fujian and Guangdong provinces. Yet, they only account for slightly above 20 percent of the population with ethnic Malay in the majority. On the island of Penang, however, Chinese-Malaysians form the majority. Peranakan, also known as Baba-Nonya, cuisine thrives in this region. The foundations are steeped in Chinese, Indian and Malay food cultures and can be found in abundance in hawker centres and casual cafes. It is common to find a variety of ethnic cuisines served in one establishment. Not surprisingly, although the majority of Malaysians do not eat pork due to religious dietary restrictions, non-halal restaurants do exist as traditional Chinese cuisine remains popular, and halal variations of well known dishes can be found with chicken, vegetarian or seafood substitutions. Penang-style char kway teow (stir-fried rice noodles) is a variant of the chao he fen (stir-fried rice noodles) from southern China. The additional use of chili and belachan (Malaysian fermented shrimp paste) creates a distinct Southeast Asian flavour. Another example of this type of hybridization is chai tow kway, a stir-fry that consists of mixed Asian vegetables and diced turnip cake, a popular snack featured in many Cantonese-style dim sum establishments. The main ingredients are daikon radish (which is the “turnip” in this case), rice flour and water. Corn starch and savoury additions like dried shrimp, Chinese sausage or ham may be mixed into the wet batter that forms the cake. The turnip cake has long been served as a dish upon itself, either steamed and served in bamboo baskets or steamed then pan-fried and served as a snack or breakfast item. In Malaysia, however, it is usually diced then tossed into a hot wok with egg, bean sprouts, garlic and kecap manis. There are multiple variations of this stir-fry with cooks often interchanging sauces, spices and vegetables. This dish is not dissimilar to the char kway teow with the main starch replaced by rice noodles. 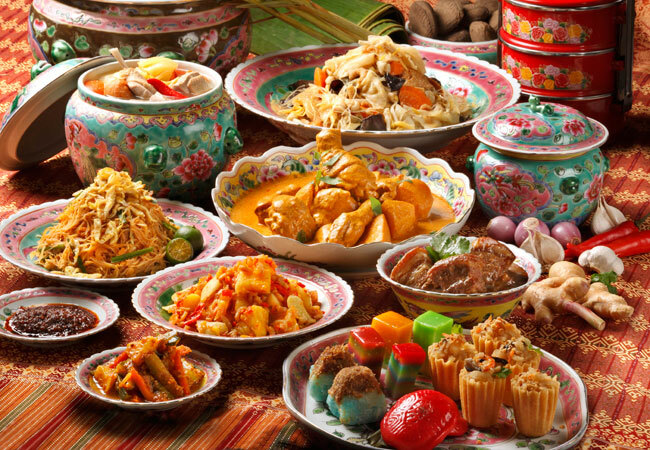 Peranakan cuisine is also prevalent in modern Indonesian society as it shares a rich cultural and gastronomic history with its neighbouring countries. As one travels through the streets of any large city in Indonesia, familiar names of Chinese food appear in romanized form at warongs and on street food carts: siomay, bakpao, bakmi, mee (sometimes spelled mi), cap cai, bakso, bakwan. It is commonly understood that Chinese traders who settled in the area in the sixteenth century brought their cuisine to the archipelago. As they intermarried amongst the local population and adopted the indigenous cultures and traditions, they also appropriated the spices and ingredients to create food that was palatable to all. Yet, as we delve into the subject of Chinese cuisine in Indonesia, we find further creolization. The popular anthropologist and Southeast Asian academic Chee-Beng Tan concedes that Southeast Asian influences are not just confined to Malay culture as there are influences from outlying Indonesian islands as well.